REVIEW: Peter Hayden and Rod Morris, An Extraordinary Land: Discoveries and Mysteries from Wild New Zealand. HarperCollins, Auckland, 2013. 200 pp. ISBN 978 1 86950 963 7. Ripley’s Believe It or Not! is a franchise featuring bizarre events, strange items and sensational records. An Extraordinary Land, with section headings such as ‘Mystery Solved’, ‘Who Knew?’ and ‘That’s Weird’, similarly sheds light on New Zealand’s astonishing wildlife and unique environments, examining many mysteries and myths. The book usefully consolidates a wide range of recent scientific research, environmental discoveries and conservational initiatives in a way that is both informative and accessible. 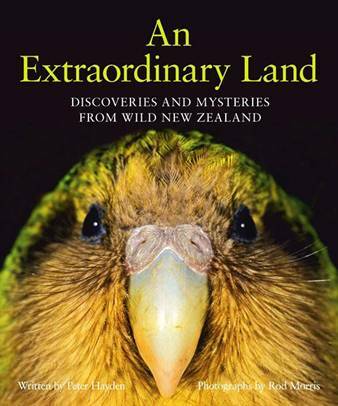 An Extraordinary Land will prove an eye-opening journey of discovery for readers, offering surprising facts about our diversity of species, even those considered familiar to New Zealanders. For example, our national bird, once denigrated as a flightless evolutionary anomaly, is in fact revealed by recent research to be a superbly adapted ‘sensory superstar’ with one of the biggest brains of any bird in the world! New Zealanders tend to take much about their environment for granted, but the authors remind us what a unique, intricately diverse land we inhabit. Isolation has ‘turned New Zealand into a wild laboratory where evolution could conduct experiments that led to weird and wonderful outcomes’. Believe It or Not! facts include the cryogenic ability of the alpine weta, the role of lizards and native bats as pollinators, the remarkable ability of the pohutukawa to spread across the Pacific and colonise the harshest of environments, and the as yet not fully understood movements of whitebait. Genetics is used to explain the suicidal defence mechanism of the bluff weta, the incredible evolutionary provenance of the extinct Haast’s giant eagle and the tolerance (or intolerance) of many species to extreme cold. Our little blue penguins are divided into two species north and south of Banks Peninsula, and the northern penguins do not like living in cold places – who knew?! The section entitled ‘Mystery Solved’ examines reasons behind our wildlife’s strange behaviour or unusual lifestyles. ‘Who Knew?’ reveals startling facts about some species, with the help of those at the front line of science and conservation. The former, by the way, includes an acknowledgement of the discoveries and contributions of children to our natural history record – scientific inquisitiveness is not solely the provenance of adults. ‘That’s Weird’ investigates the extremes of evolutionary diversity – an alien world of super-sized species, waddling mice and boxing bats. ‘To the Rescue’ deals with the work of preserving native species in the face of introduced predators, outlining many conservation projects and success stories. The authors both share a background with the Natural History Unit and they bring the same standards of production quality to this book. Peter Hayden’s text is conversationally engaging, conveying his enthusiasm and reflecting his considerable qualifications for the subject as a writer and producer of documentaries. The text is superbly complemented by Rod Morris’ photography. It is possible to become inured to ubiquitous books of New Zealand nature photography but Morris – with his dramatic and revealingly intimate portraits of birdlife in particular – is an artist at the top of the game, showcasing a career of over 30 years. Overall, this is a well-researched journey of delight and discovery – a charming and interesting eye-opener of a book to be enjoyed by readers of all ages.